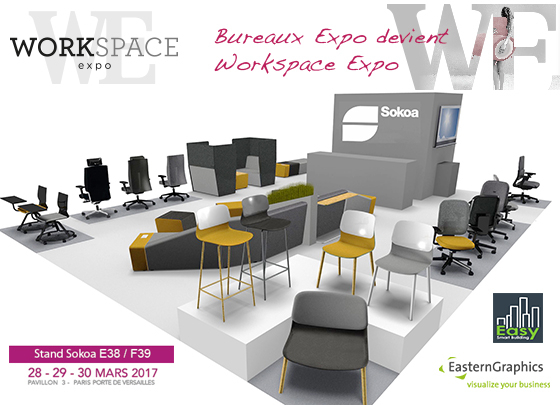 SOKOA will exhibit at WORKSPACE from 28 to 30 March 2017 in Paris Porte de Versailles. SOKOA invites you to discover our brand new seating solutions such as ALAIA, KLIK, BOST, MENDI and IKASI at WORKEXPO, the French appointment of design professionals, furniture and solutions for workspaces from 28 to 30 March 2017 in Paris Porte de Versailles. On our virtual reality system corner, our complete range will be displayed while you are walking around our 3D showroom. Last but not least, your visit in our stand will allow you to test our smart building Apps and connected office chairs presented by our sister company Easy Smart Building.